In medium bowl, mix Waffle Biscuit ingredients. Cook in waffle maker as directed by manufacturer. Meanwhile, in 10-inch skillet, cook sausage over medium heat. Add flour; toss to coat. Add milk gradually, stirring constantly. Increase heat to medium-high. Cook about 5 minutes, stirring frequently, until thickened. 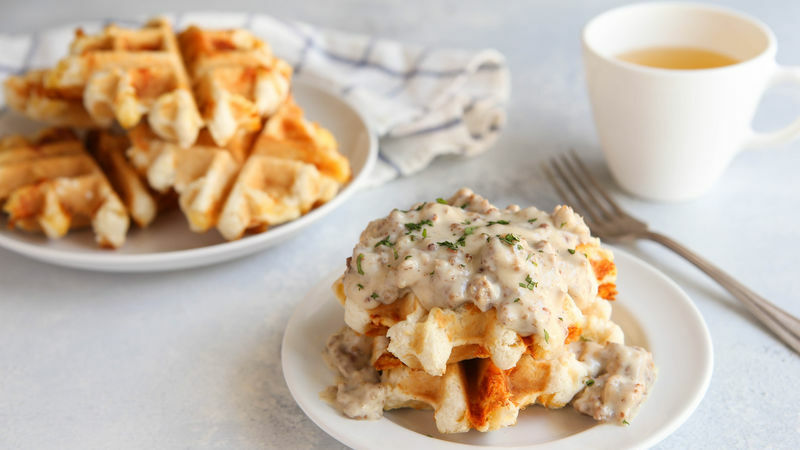 Serve immediately over waffles. For a complete meal, serve topped with a fried egg. Keep waffles warm in 200°F oven in single layer on sheet pan until ready to serve.